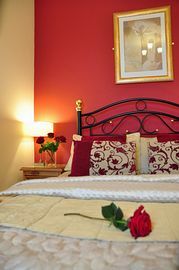 We are a small and friendly Bed and Breakfast, with a Four Star Silver award. 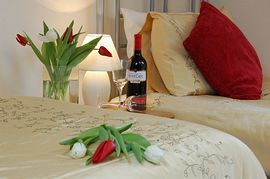 All our rooms are en-suite, with free WiFi, LCD TV with free view DVD player, tea and coffee making facilities, brita water filters books, maps and trouser press. 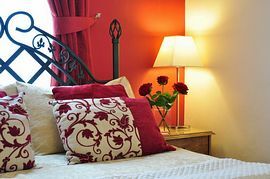 Visit our web site for further information about our colour schemes and location, via a link to multi map. The race course is a ten minute walk for both, the races and various exhibitions, or other events; both the City walls and Cliffords Tower are also a ten minute walk. Our Deliciously Yorkshire Breakfast's, have just been recognised by the Yorkshire Regional Food Group, for our locally sourced produce. We also cater for any special diets wheat, gluten, and dairy free; also cater for people who are vegans and vegatarians. Our freshly baked homemade bread including gluten/wheat free goes great with our home made jams the fruit we pick ourselves from the local farm. Our honey is from the local bee keeper and our meat and free ranges eggs are from the local butchers farm. If you would like more information about what we offer, just give us a ring or email us and we would be more than happy to help. Our family room that can be a double and a twin . 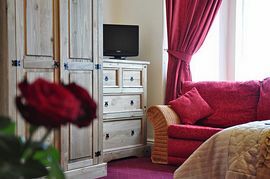 £32.00 per person per night. 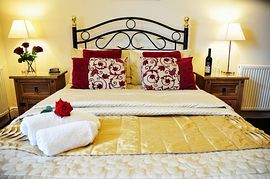 £32.00 per adult per night and £18.00 per child over the age of 15. These prices can vary during the races and bank holidays, but for more information please give us a ring or email us. We are open all year; for further information please give us a ring or email us. Smoking Facilities: Smoking is not allowed. Smoking is only permitted in the exterior of the property. with people who are vegans and vegetarians. We are also able to provide any other special requirements with prior arrangement. Disabled Facilities: There are no disabled facilities. A disabled parking bay is available. Take the number 11 bus heading down Bishopthorpe Road - the required stop is Cameron Grove. By Car: Check our web site for a link to multi map. From Leeds Bradford airport: visit www.yorkaircoach.com for times of the coach service running between Leeds Bradford airport and York.